A new federal recovery plan for Gulf Coast Jaguarundis – rare and enigmatic felines that are slightly larger than house cats – calls for the animal’s reintroduction to the south Texas area. Jaguarundis, which have long necks, short legs and elongated tails, have been protected as an endangered species since 1976. However, the closest known population is 130 miles south in Mexico. 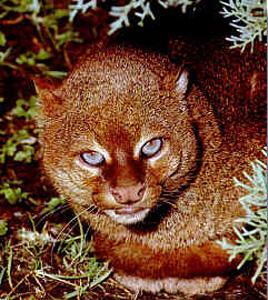 Gulf Coast Jaguarundis (Puma yagouaroundi cacomitli) are often active during the day, allowing sightings of the black, brown or reddish unspotted slender cats with small, flattened heads. Jaguarundis appear to have disappeared from south Texas due to habitat loss to agriculture and residential development; the last known Jaguarundi in the state died on a road in 1986. “Returning Jaguarundis to the thickets and grasslands of the Rio Grande Valley to hunt for rodents and reptiles could help protect these fascinating and little-studied animals from extinction,” said Michael Robinson of the Center for Biological Diversity. The U.S. Fish and Wildlife Service recovery plan calls for ending Endangered Species Act protections for the Gulf Coast Jaguarundis after there are 500 animals distributed among three populations with connectivity between them, which is important for genetic health. Distribution and numbers of the Gulf Coast Jaguarundi in its Mexican range are poorly understood. Border fencing poses a threat to future connectivity between Jaguarundis in the United States and Mexico, but the recovery plan confirms there are locations on the border where wildlife can still cross.